Started 13 years ago, Take Your Dog to Work Day is the holiday that brings added meaning to working like a dog. We hope all of our readers are sharing their corner offices and cubicles with their best friends. And while it’s OK for your dog to bark orders at the office, remember that you’re still the boss when it comes to commuting. 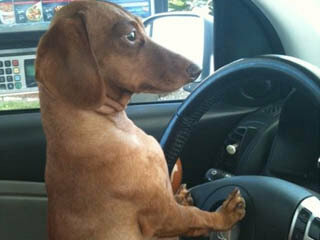 So make sure your pals keep their claws off your seats and paws off your steering wheel. This entry was posted on Friday, June 22nd, 2012 at 1:36 PM. It is filed under Blog. You can follow any responses to this entry through the RSS 2.0 feed.